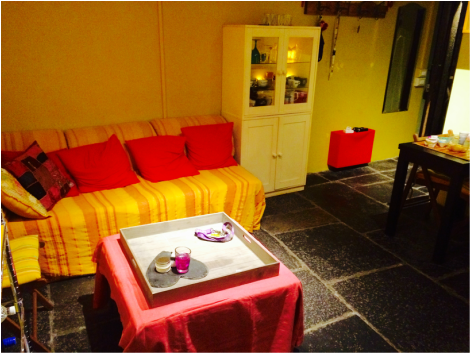 The apartment is in the historic village (Borgo) Pognana Lario. It is situated on the ground level of an old building (Castello). The total building contains 4 apartments, however the owners are not active residents wich makes 'us' the only users of the building. This guarantees a restful stay and a free use of common areas. The 50m2 apartment is basic and holds a livingroom, open kitchen, small bathroom and a master bedroom on the ground floor. 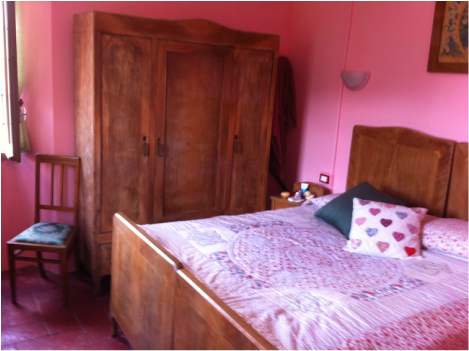 There is a seperate bedroom adjacent the garden, which only can be reached via the garden and the gardenroom. The size of the apartment as well as the number of beds available, makes it suitable for 4 persons. The livingroom consists of a seating area (sofa), a kitchentable (expandable) and chairs, and an open kitchen. For cold nights there is a stove (woodburner) in the livingroom. The facilities are basic but offers you all the comfort you need. In the livingroom one can turn the sofa as well as the pouf in to a sleeping beds, which gives you an extra sleeping facility for two extra persons. The small kitchen has a kitchen dresser and a sink. There is a tablesize fridge wich has a freezer compartment in it as well. Sat-tv (and dvd), and wifi are free to use. The master bedroom has a doublebed (180 by 200) and enough storage for all your belongings. The front window gives you an excellent view over the lake. Antother bedroom is available if you require, however this bedroom is only accessible via the garden, meaning you have to go outside and walk through the garden to the bedroom that is right underneath the apartment and adjacent to the 'garden room'. If you feel umcomfortable with this, you can create extra sleeping facilities in the livingroom by turning the sofa and the pouf in to two single beds. The bathroom is renovated at 2015 and offers a shower with jets, a toilet and a sink. Enjoy to the fullest from the outdoors .. just take a relaxed seat on the sunny balcony, find some shade under the trees on the other terrace , have a dinner or a BBQ on the terrace in the garden or get a nice sunbath on the terrace at the back of the garden, which has a splendid free view over the lake! Because there are 3 terraces you can always find a spot where it is sunny or shady. 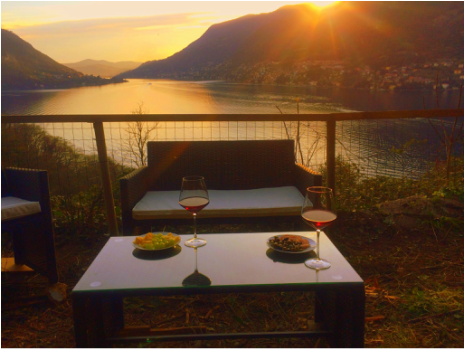 Besides, each outdoor area gives you nice views over Lago di Como.